Deep in history, a man penned a letter to people he’d probably never meet. His vision was far beyond the recipients, as he hoped his words would motivate them to engage the people of Italy and Spain. It’s a dance, right? It takes courage to integrate in society and yet live counter-culturally. It takes wisdom to pursue community without being influenced by a value system ruled by what’s temporary. And even among faith circles, we sometimes have to go against the grain by choosing a gospel-centered life instead of the “safety” of religion. Paul’s letter was a bit of a roadmap on how to swim upstream. And swimming upstream leaves us so weary. And we know that in all things God works for the good of those who love him. (Romans 8:28). I so wanted it to be all about my circumstances. For years I read Paul’s words and interpreted them as a promise that God would work everything out. Or I’d eventually have my way. Or things would at least make sense some day. But his heart-wrenching statements in the whole letter – before and after this tiny excerpt — whisper to wake up deaf ears. He pries open blind eyes. They call to every mortal, resonating with all who’ve felt the tension — the tension between the sin fostering our brokenness and an honest desire to be different. Sin patterns and surrender. Might Paul’s promises really be about changing our HEARTS rather than our circumstances? Maybe believing He’ll “work for the good of those who love Him” means fear won’t be my master anymore. I wish I was there today. Maybe I’ll hold my suffering in the palm of an eternal perspective. And maybe my hope will be so great that I ache inside… my hope to be like my Redeemer… my hope for intense intimacy with my Maker. “In all things God works for the good of those who love Him.” It’s really not about our circumstances. No, it’s truly all about our hearts. He’s refining you, molding you, repurposing your heart to receive His deepest affections… To receive His love letter that bleeds with grace. Be strong, I thought as I silently scolded my quivering voice. Deep breath. Don’t you dare let those eyes water. “I’m sorry this is your story,” I said to my 13 year-old. “I’m sorry this is your story, too,” he replied. My goodness, how does he do this? How does he balance between childhood one minute and manhood the next? I was trying to comfort him, and he let his tenderness spill out, flowing right toward me like a stream I wasn’t expecting. We were talking about nothing life-threatening. Nothing that would look tragic to someone on the outside. To us, though, the ache we whispered about, the pain that was reaching both our hearts, was real. It was a simple conversation in the car that suddenly turned intimate. And here we all are — well into the second half of 2015. I had intentions of taking a seat at the table again as we approached mid-year. July 1. It would be a Happy New Year and a Half post, full of reflection and challenge and grace as we pondered where we all were on December 31, 2014… and what we were hoping for on January 1. But sometimes you literally can’t find words. Sometimes you must wait for your mind and heart to intersect again, in what you know and believe to be true, before you bring words into the equation. And as hard as it is to give yourself grace in the silence, sometimes it’s your season to be quiet. When you can’t find clarity within, it’s certainly hard to join the conversation again — especially that cyber one. I remember back to last New Year’s Eve. I was weary, carrying burdens that really weren’t mine to carry. I was in the company of dear friends and slipped away for a moment, succumbing to social media numbing myself with social media. 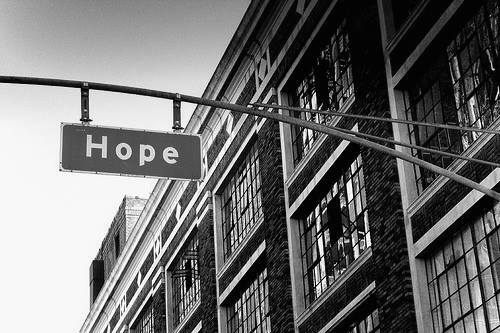 And somehow, I stumbled upon this photo of a street called “Hope” victoriously giving direction through the brokenness. This will be my story in 2015, I determined. I am choosing Hope. A picture says a thousand words, and this would be my voice. So I boldly posted and shared this photo of Hope personified. Thank goodness we can’t see the future, for if we did, we’d be constant cynics. “They’re really struggling,” I said to my husband recently. “Who isn’t? !” he replied. It wasn’t said in disgust, but almost in a comforting tone. I read between the lines. He was speaking truth again. We’re not lone victims, Christan. Our chapters read differently, but we’re all surrounded with the reality that we were made for a different Place. We’re all kind of aching for something that doesn’t exist here, yes? Another school year’s about to start. And you know what a whirlwind fall is, as we hold on tightly and watch life quickly unfold into new stories. It’s easy for me, come August, to mentally place myself in the autumn cool and the bustling holidays and another calendar year coming to a close. We blink, and what in the world?! We’re already Christmas shopping after stocking up on pencils and glue sticks and notebooks galore. I’m still so thirsty, and I’m really needing those streams in my desert. I look at my friends, my dear community near and far, and they’re choking on broken relationships and cancer and parenting aches and racial inequity and loneliness and mental illness and more. They need grace to wash it all down. My friends — those I hold dear have carried quite a bit in 2015. And if I’m not careful, I start doubting in my mind what I know to be true in my heart… I am preparing a way through the desert; Waters will flow where there had been none. But in the voice of a child, or in a young teenager this time, I’m reminded that I am seen, and those I love are not forgotten, and Hope really does rise boldly out of the rubble. “I’m sorry it’s your story, too, Mom.” You see, I was resenting the fact that sometimes you just can’t protect your kids, and out of nowhere, I drank in empathy. And tenderness. And I saw facets of God’s character I had been ignoring.